The M-1 was the standard weapon of the US infantry soldier in World War II. It is semi-automatic, fed by a clip that holds eight caliber .30 cartridges. It is gas operated, self-loading, and a shoulder weapon. The gun weighs 8.94 pounds, is 43 inches long, with the barrel itself being 22.30 inches. The Garand has a muzzle velocity of 2,760 feet per second, and a maximum range of 5,500 yards. A bayonet can be attached to the M-1, giving it a reach of about five feet. In Combat!, the M-1 Garand rifle was used by Caje, Littlejohn, and Billy. Rifle-grenades are attached to a grenade launcher that fits over the end of the M-1. Rifle grenades are fired by Braddock in the episode "A Day in June" and Kirby in "No Time for Pity." Some versions were a 60 mm mortar shell attached to the grenade launcher. 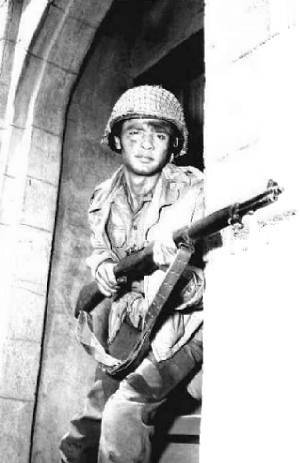 At left: Sal Mineo in the episode "The Hard Way Back" holding an M1 Garand rifle. You will often see another American rifle, the Springfield rifle, in Combat! episodes. This earlier rifle saw service in WWI. The rifles used by the British soldiers in "What are the Bugles Blowin' For?" look to be American Springfield '03 rifles, a bolt-action weapon developed in 1903. 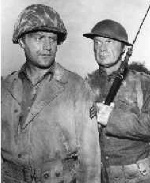 In the episode "Doughboy," Eddie Albert's rifle is an authentic WWI era Springfield. A heavily illustrated, practical history for shooters and collectors alike, this book tells the complete story of the robust M1 Garand. High-quality, detailed photos; functional and troubleshooting data, including original military manuals; market information and much more make this a valuable resource on a classic battle rifle. Author Jim Thompson has a great, personal style of writing that is easy to read and shows his passion for this weapon. He weaves stories of war and peace uses of the Garand throughout the text. More than just a dry technical reference, this is a actually a book from the heart, as shown by his moving dedication to a friend. The world's most popular and respected author on WWII firearms presents his most complete examination of the M1 Garand and the M1 Carbine ever. Packed solid with the kind of useful, hands-on knowledge that readers have been demanding. Detailed, close-up photographs show the specific features that separate valuable rarities from fakes and rebuilds. Covers all the manufacturers, with easy-to-understand explanations of all the components, parts, variations and markings. Learn which parts are proper for which guns and avoid being fooled. 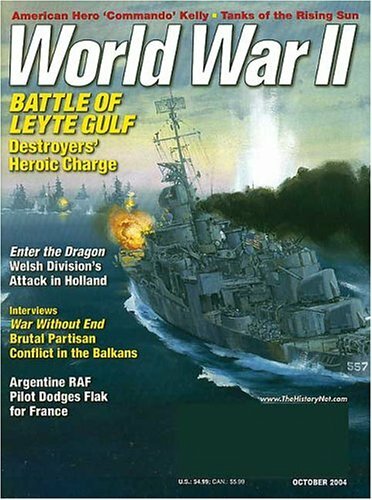 Over 300 clear, large photos show you features, markings, overall views and actions shots of the guns being used in battle. 33 tables give you instant reference to the facts you need the most. This is simply the most complete and useful guide to these very important military firearms. The M1 Does My Talking : The US M1 Garand Rifle In Pictures, WW2 and Korea . Over 300 black-and=white and color images fully document the Garand Rifles origin, development, battlefield use, and postwar experimentation. Thank you! Your purchases help keep this a free site!